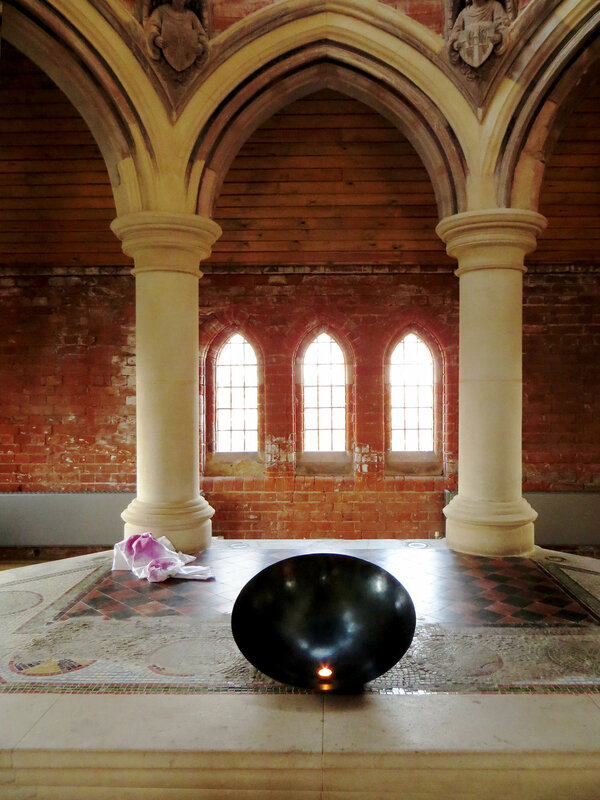 A steel bowl containing water from the River Effra was placed in the Lady Chapel and left to evaporate for 85 days. The piece created a series of photographs documenting the transformation of the bowl over time. This piece was made for the first week of Advent in response to the reading Isaiah 64:6-9. This piece was made for Ascension Day. The cotton which had recently been used as the Easter Shroud was suspended in the Entrance Narthex of the church, and the vinyl lettering displayed on the glass entrance doors. This piece was made for Penetecost Sunday. The red vinyl lettering was adhered to the glass entrance doors and the sheet, which had recently been the Easter Shroud, was dyed and torn into a long strip and suspended from high in the chancel roof. An industrial fan created a sound-piece and movement during the Parish Eucharist. This was the last piece made for the residency. The rusted steel bowl had been transformed to gold for All Saints Day and was now displayed in the Lady Chapel in a circle of autumn leaves. Members of the congregation were invited to bring family linen, as well as some church linen, to wash communally and share their stories. It was hung across the chancel to dry, and later ironed and folded by the artist and returned on the following Sunday. The title Fair Linen refers the name of the upper layer of altar linen, normally of the highest quality. The hook was commissioned via 'expressive instruction'; a poetic brief that invited collaborative creativity. I need a hook to hold everything up"
The hook was presented by the blacksmith's son as part of 'Offering' on 22 September 2015. Reaping Image. Steel bowl, wheat. Divya choreographed and performed the lyrics of the hymn 'Now the Green Blade Riseth' and initiated the planting of wheat in the church garden. The local community joined in and the wheat was harvested in August, milled locally in Brixton and baked for the Harvest Festival in September. Water from a tributary of the River Effra was collected in a galvanised bucket. The photos document what was revealed as it became still. Sara Mark’s residency at All Saints, West Dulwich took place over a liturgical year. Mark’s brief was to respond to Christian spirituality, engaging with the church’s space and enabling community participation. In response to this brief, Mark collected a ‘palette’ of ordinary objects and materials to ‘live’ in the church and be transformed by their use. Mark’s residency was unusual in its length; few institutions are able to host an artist for a full year. This commitment of time by the artist and clergy was repaid in the quality of artistic output and the depth of community engagement. All Saints, West Dulwich is a Major Parish Church in the Diocese of Southwark in the Greater London Authority. It is Victorian, built between 1888-1891. It is an important example of the work of G.H. Fellowes Prynne and sits over large crypt spaces that are used by the wider community. All Saints suffered from a fire in 2000 that claimed the roof. It has since been restored, deliberately leaving visible the scars from the fire. The restored elements are modernist in style, including large windows which filter in light and a gallery above the nave. Since the fire, the parish has welcomed multiple artists who have presented temporary installations, participated in residencies or contributed permanent additions to the churches’ art collection. All Saints aims to enrich its community through support and by nurturing faith. The church has set up community projects in its locality via the charity ‘4ALL’. It also has an established partnership with the local ‘L’Arche’ group, a faith-based community formed of people with and without learning disabilities. Mark was not the first artist in residence at All Saints, so the church had the benefit of experience when developing a brief. A number of artists responded to a notice about the position, and two were subsequently interviewed. A planning meeting took place before the residency began, where it was agreed that the project would be framed around the liturgical year. On starting her residency, Mark gave an introductory talk to the congregation and leaflets were printed to advertise her arrival. During the residency, she attended weekly meetings held by the clergy to help coordinate activities. The schedule remained tied to the liturgical year as agreed, though at individual events much of the activity unfolded organically. The residency launched in September 2014 with a participatory piece entitled Offering, in which the eight objects and materials; a hook commissioned from a local blacksmith, a sack of wood ash, water from the River Effra, 200’ of rope, a steel bowl, a bucket, a bedsheet and a bag of wheat – were offered at a Sunday Eucharist. Mark commissioned the hook with an ‘Expressive Introduction’, a poem which invites collaboration, making the request part of the work. Following Offering, the season of activity began with the 200 feet of rope, which subsequently became part of Way-Makerin Advent. The repurposing of materials continued with the rope, hook and linen becoming part of the Easter service. Here, strips of linen were sewn together to form a shroud which was draped over the cross on Easter Sunday. Mark’s interventions extended from the church to its garden withVernal, which involved the planting and harvesting of wheat. Mark invited a collaborator, Divya Umakanth, to choreograph and perform a classical Indian Bharatanatyam dance. Umakanth danced to the phrase ‘Now the Green Blade Riseth’ before planting a wheat seed in the church garden. Following this, seeds were planted by children from two local Primary and Special Needs schools, and members from the L’Arche London community group. The wheat was harvested later in the year and the same children returned to make bread from the flour it produced. Participation was also central to Fair Linen, where members of the congregation and wider community were invited to bring a piece of their family linen to the church. Participants shared the stories connected with their linen as they washed it, along with the church linen, and hung it all out to dry. Mark made few finished ‘pieces’, but her materials, in various forms, remained in the church. Their scale allowed them to integrate easily into the space. Posters of the performative events Vernal and Fair Linen hung in the church for several months after each had happened, serving as records of the fleeting activities. Mark’s concept for the residency favoured performance, community activity and the transformation of existing materials. Because of this, no fixings to the church interior were required. As a result, the DAC were not informed of the project, though permission was obtained to install a flexible hanging system. Participatory events were generally advertised via announced ‘notices’, flyers and posters several weeks in advance, though some were installed unannounced and referred to in sermons or were the focus of liturgies and meditations. Participation was always at a level that different individuals could decide for themselves, which allowed some to embrace the activity wholeheartedly and others to dabble rather more cautiously. Much of the residency focused on work with congregation members, though ‘Vernal’ effectively engaged people from beyond the church community. Some events attracted very few participants (1-3), though for Mark these were still successful because those who did attend were deeply affected and consoled.